I've barely worn trousers in years. Other than a few pairs of elastic-waisted casual trousers, and my beloved culottes, I've generally favoured skirts and dresses for my me-made wardrobe. 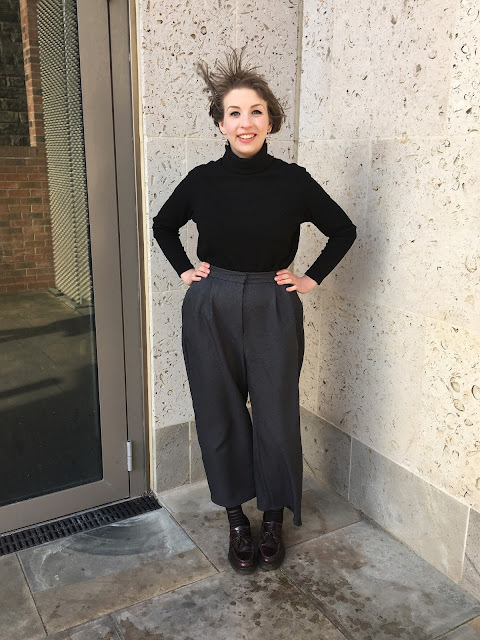 But as a considered part of stepping up my sewing game, I'm finally wearing the very first pair of 'proper' trousers I've ever made for myself - including the formerly feared fly-front fastening - and I'm pretty pleased with the results! 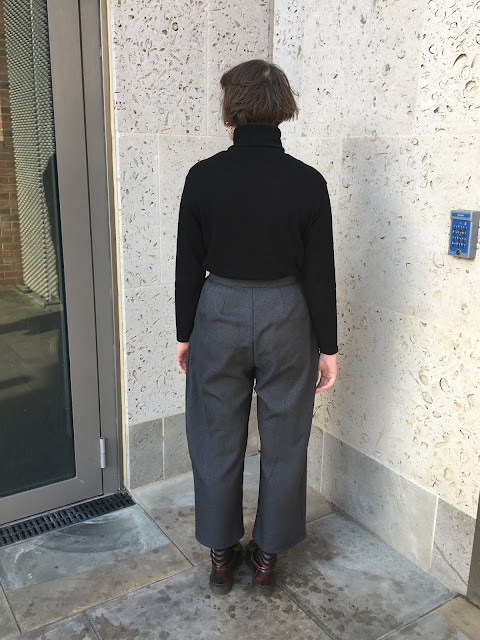 This is only my second attempt at a pair of 'proper trousers', the first being for someone else using the same pattern - for a project I can't wait to tell you about, hopefully soon! After the initial fear of the fly-front, I'd been surprised at how easily they came together, and loved the finished pair so much that I wanted my own version. 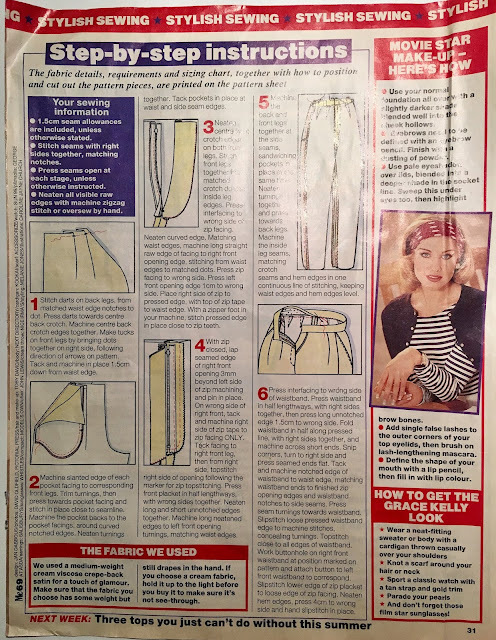 The pattern is a pretty retro magazine pull out from June 1993's Me Magazine, and is a part of a wider collection that I was very lucky to inherit from my former school textiles teacher when she moved schools last year! And here's a bit of Pinterest trouser inspiration which also spurred me on to make up the pattern! I used a soft, grey, poly/cotton mix from Lucky Fashions in Dewsbury, purchased at last week's fab #sewdowndewsbury meet up. If you're ever in the area, I'd recommend checking it out - they had a great selection of fabrics, loads of crepes (my favourite! ), and the prices were really good too. This fabric was only £4.40p/m and has the feel of a lighter-weight wool - perfect for a pair of trousers to take me into spring! Just like my until-recent-aversion to shirt making techniques (tackled with the Ralph Pink Sahara Shirt and the V9186), I'm finding that some techniques definitely aren't as hard as I've built them up to be! The slanted pockets were fun and simple to construct, and along with the front tucks, they create a great shape. And the fly-front was pretty straight forward, even with project instructions minimal enough to fit on one side of A4! 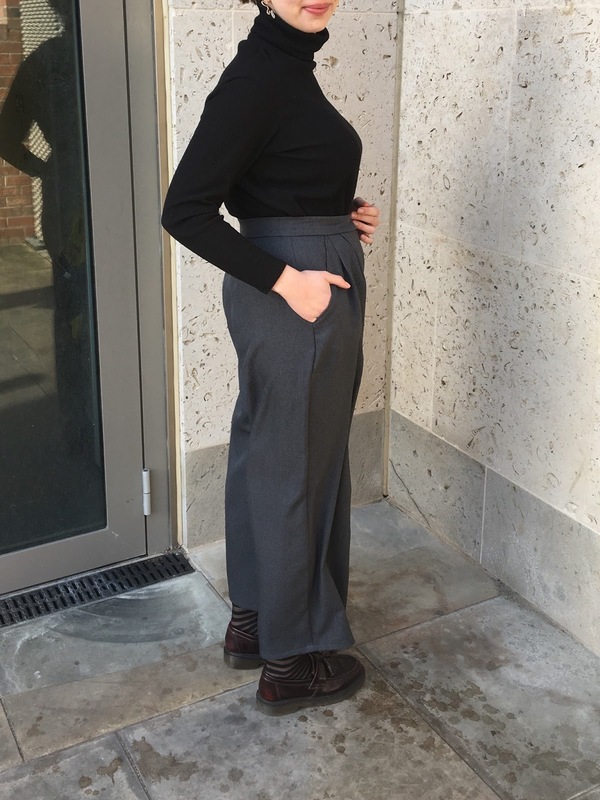 The sizing charts were definitely on the smaller end of the scale - I put this down to the pattern being 'vintage' - so I made a size 16, which should have been a little small on the waist if anything judging by the measurements given. The finished trousers actually came up with a ridiculous amount of ease. I took a 2cm side seam and adjusted the waistband to match before stitching it in place, but I can still pinch a good inch of excess. They're quite relaxed in fit anyway, so totally wearable, and I'm encouraged by the results to make another pair, but I'll probably size down next time. 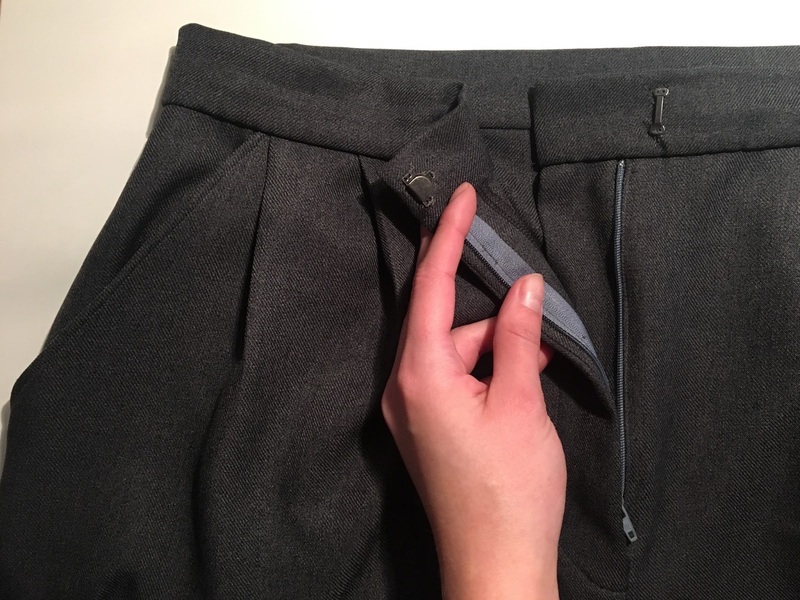 You may notice on some of these pictures that the waistband looks a little creased at the front, something which seems to happen often to my handmades with wear. I know that I've caused this in part by stitching the bar of my hook and bar fastening a bit further over than it should naturally sit (to try and get the waist to fit a little closer) but I wondered if it could be the interfacing? I used a mid-weight interfacing, but would something a bit heavier prevent this? Advice welcome! Back view - excuse the funny bum rumples - the result of a windy day! 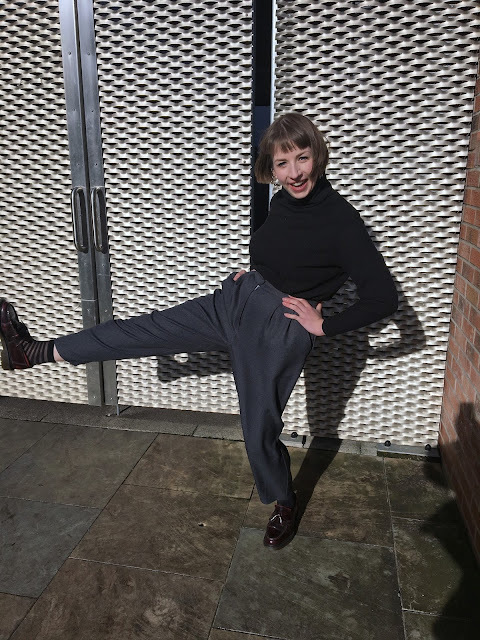 I skipped my original plan of turn-up legs after an unsuccessful attempt, and cropped them at (what I consider to be) a more fashionable, awkward-ankle-flashing length. I even bought myself some fancy socks now that I have the opportunity to show them off! 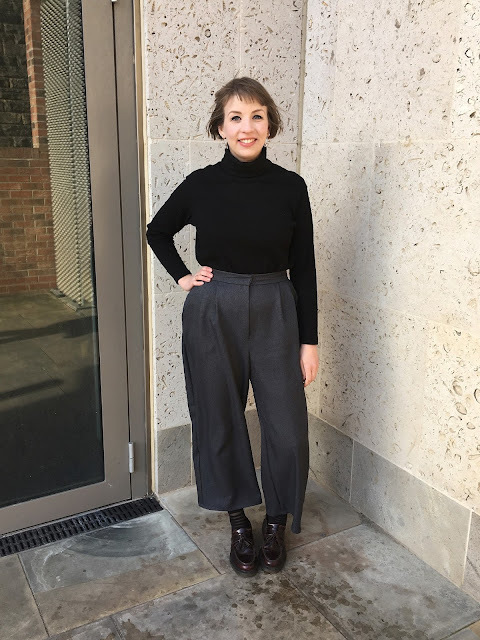 The trousers seem to pair well with my fairly sizeable collection of Rise/Fall Turtlenecks, and the length sits nicely with my black pointed ankle boots too - a whole new world of wardrobe possibilities has been opened! ...and I can do a whole new range of poses! It might be unlikely, but if you ever come across the pattern I'd definitely recommend it! I know I'll be using it many times more now I'm a fully fledged trouser maker! This might just be the start of something...Can anyone else recommend their favourite trouser pattern? Well done! I too, have found my waistbands a bit ripply from time to time. I've found success using a sew in interfacing made specifically for waistbands...I think it comes about 1-1/4" wide. Right now I'm working on fitting Sewaholic's Thurlow Trousers. 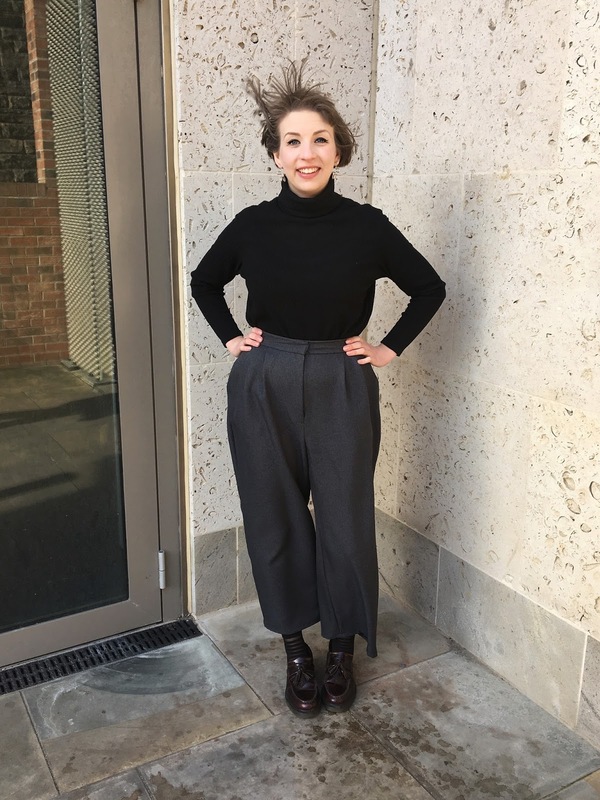 I haven't come across the Thurlow Trousers until now, but they look fab - might have to add them to my list too! Don't you think sometimes we inherit other sewers fears and hang ups? 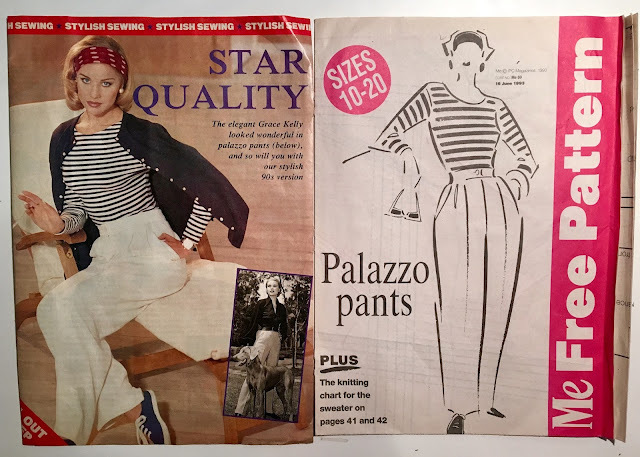 Before I discovered sewing blogs I'd never heard of tracing, muslins and would give anything a go! And now I trace nearly everything, Muslin nearly everything and put too much thought into my sewing instead of just getting on with it! I think I'm going to try and be more carefree with my scissors and sewing machine! I definitely agree. There are a lot of things that I've avoided because they've been built up to be difficult by others. Each to their own of course, but maybe social media is, in part, helping us to spawn an accidental culture of anxiety/fear around approaching certain techniques! 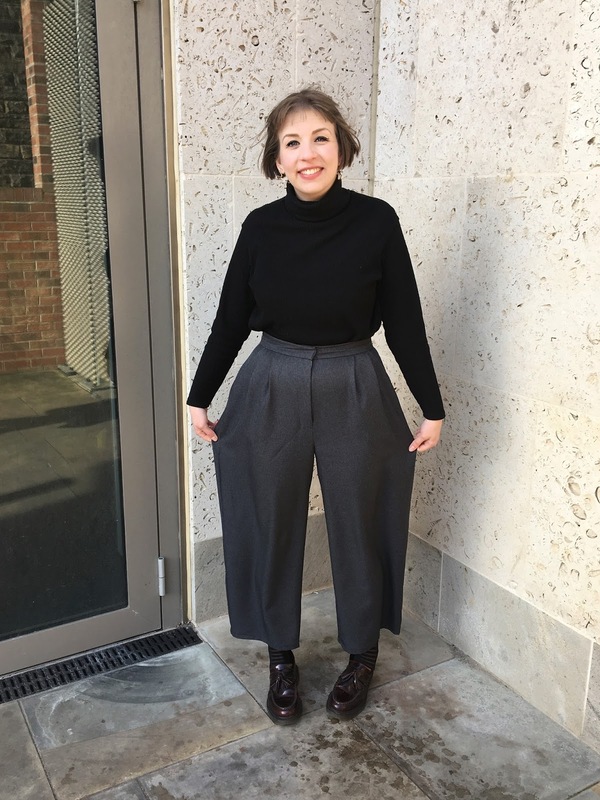 Great pair of trousers, well done! I especially like the 'awkward' length, my fave!